Mayor Nutter transmitted a clear message to developers in his Planning Address on Tuesday Night. "Tonight I want to make it crystal clear the Philadelphia City Planning Commission is the Authority of Planning and Shaping Development in Philadelphia"
But the most exciting words for the bicycling community came eight minutes in his speech. "We are a walkable, increasingly on to bicycles, we want to preserve our urban form. We do not want the Automobile to dominate our landscape . We are a mass transit, bike sharing, power walking, proud city." 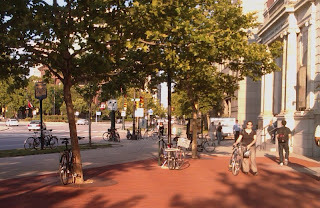 The lack of bike parking at the Academy of Natural Sciences didn't deter people arriving by bicycle. 32 Bikes were parked between 19th St and the Moore College of Art.